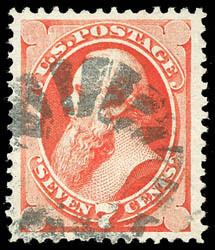 Segmented Circle, full strike on 7¢ vermilion (149), exceptional centering within extra large margins, choice and Extremely Fine; with 1993 and 2005 P.F. certificates. Weiss No. TR-W19 Estimate $300 - 400. A link back to Sale 74 - Lot 2012, along with its description, will be appended to your message.